Update: Article 31 Committee Deems Privacy Shield Adequate, “New Safe Harbor” Takes Effect August 1. Transferring Personally Identifiable Information (“PII”) data between the EU and the US is about to get easier. As expected, the “Privacy Shield” was deemed adequate by the Article 31 committee on July 12, despite concerns of the Article 29 working party. The ideal of cooperation by opposing parties to address eDiscovery has been around for a while now. 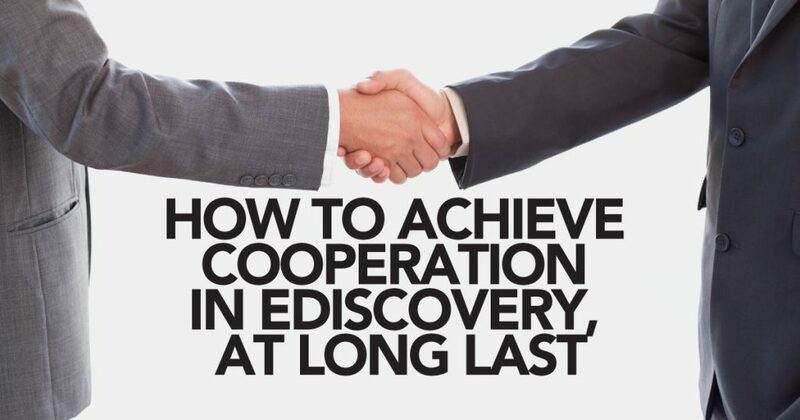 Since the The Sedona Conference Cooperation Proclamation called for “cooperative, collaborative, [and] transparent discovery” in 2008, adversarial cooperation has been touted among the judiciary and certain practitioners as the key to success in proportional discovery. The push to develop an information governance (IG) program is often stonewalled by the great interrogative “why.” Questions like “why are we budgeting money to solve a problem that does not exist?” can derail promising programs even when justified by a proper use case.